Characterizing the gritty, cutting-edge Aquaracer concept, this sporty #WAJ2115.FT6022 TAG Heuer Aquaracer Leonardo DiCaprio Ltd. Edition Men’s Watch is a prestigious timepiece that exudes confidence and exceptional function, as well as philanthropy. 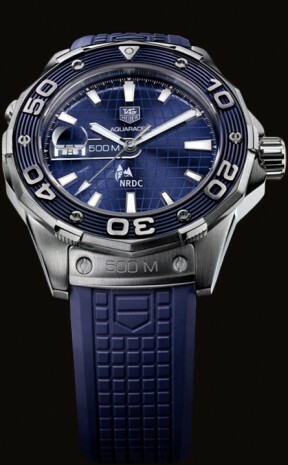 TAG Heuer and Leonardo DiCaprio have teamed in an ambassadorship to support the Natural Resources Defense Council (NRDC), signified with the Council’s logo at the 6 o’clock position. Bold and progressive, this limited edition diving watch is water-resistant to a depth of 500 meters (1650 feet), also denoted on the watch face. Featuring an electric blue dial with meridian line effects, the #WAJ2115.FT6022 TAG Heuer Aquaracer Leonardo DiCaprio Ltd. Edition Men’s Watch is powered by Calibre 5 TAG Heuer automatic movement. It includes luminescent markers on the hands and indexes, and a magnified date window at 9 o’clock. The 43mm diameter case is fine brushed steel with polished edges; the unidirectional rotating bezel is coated in shiny blue epoxy. A luminescent dot marks 12 o’clock. The sapphire crystal is scratch-resistant and anti-reflective with a screwed-in blue polished steel crown. The numerals are crafted from fine-brushed stainless steel marking the minutes of the hour, interspersed with polished studs. The #WAJ2115.FT6022 TAG Heuer Aquaracer Leonardo DiCaprio Ltd. Edition Men’s Watch includes a blue rubber strap with solid steel clasp, diving extension system, and safety push buttons. Truly an über-sports timepiece, the #WAJ2115.FT6022 TAG Heuer Aquaracer Leonardo DiCaprio Ltd. Edition Men’s Watch radiates masculinity and sophistication for the discerning man.